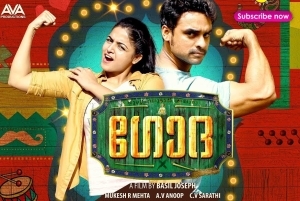 In Punjab, Aditi Singh (Wamiqa Gabbi) is a Punjab University wrestling champion. Her late father had encouraged her to take up wrestling from a young age but her older brother restricts her, sometimes through violent means. In a small village in Kerala, wrestling used to be a passion for the old generations but the younger generation has moved on to cricket. They frequently clash over Manayathuvayal, a large field where wrestling competitions used to happen years earlier. Aanjaneya Das (Tovino Thomas) is one of the youth of the village that play cricket and is generally aimless in life. Captain (Renji Panicker), who used to be the wrestling champion of the village and his father, sends him to Punjab University against his wishes to enroll him in Master’s. There he meets and befriends Aditi and he falls in love with her.